If you've been considering either an iRobot Roomba or Bissell SmartClean vacuuming robot, but can't quite decide which brand and model to select, you may find this article useful. 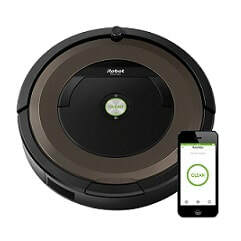 ​Note that iRobot presently offers a number of Roomba vacuuming robots, ranging from the most basic to the most advanced, while the only vacuuming robot offered at this time by Bissell is the SmartClean 1974 that replaced the previous models (such as the SmartClean 1605). ​Therefore, to simplify your task of choosing the right robot for your needs, we will consider Roomba 690 and 890, which are two of the most popular Roomba robots offered by iRobot today, and that are comparable in terms of features to Bissell SmartClean 1974. This article will compare the Bissel SmartClean 1974 with iRobot Roomba 690 and Roomba 890. Otherwise, please read on below for a detailed comparison of the above listed Bissell and Roomba robots. 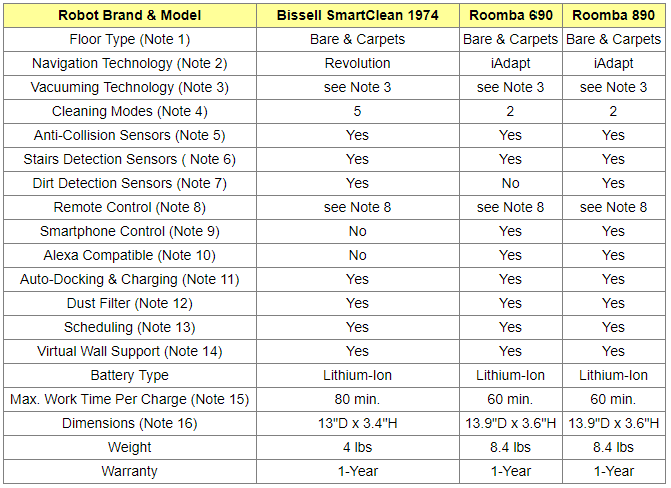 ​The following table compares the Bissell SmartClean 1974 with Roomba 690 and Roomba 890 robots. All three robots considered here can be used both on bare floors such as tiles, hard floors, laminate or linoleum, as well as on low pile carpets. The Bissell Revolution navigation technology provides the SmartClean 1974 robot with excellent coverage along edges, corners, even under and around furniture, including tables, beds, and chairs, and other hard-to-reach places. The robot is equipped with anti-collision and cliff (like stairs edges) detection sensors so it can cover safely the space to be cleaned without falls or collisions. It recognizes and adapts to multiple floor types including hard floors, low-pile carpet, laminates, and tile. Thanks to optical sensors, it seeks out dirt and debris, performing concentrated cleaning in your most heavily trafficked areas. ​It comes with the Invisible Wall (also known as Virtual Wall) feature that keeps the robot in the rooms you want to clean and out of the ones you don't. iAdapt technology found on Roomba 690 and 890 is composed of sophisticated software as well as sensors, and allows these robots to clean thoroughly the room, making multiple passes, avoiding stairs, getting under and around furniture, and cleaning along wall edges and corners. Both Roomba robots come with a Dual Mode Virtual Wall Barrier to prevent the robot for entering rooms and areas that are not supposed to be cleaned. Bissell SmartClean 1974 uses a triple action cleaning system composed of a single rotating main brush roll to unseat and lift embedded hair and debris, dual spinning edge brushes to clean edges and corners, and powerful suction to gather loose dirt into the dust bin. Multi-surface cleaning feature self-adjusts the robot to easily cover low pile carpet, hard floors, tile, and laminate. Thanks to optical sensors it seeks out dirt and debris, performing concentrated cleaning in your most heavily trafficked areas. - The two main brushes Roomba 690 is equipped with are counter-rotating multi-surface brushes: One to loosen dirt and the other to pick it up. The brushes work together to grab and remove dirt, dust, hair, and large debris from your floors. - The two main brushes Roomba 890 is equipped with are dual counter-rotating multi-surface tangle-free multi-surface brushes that pick up dirt, dust hair and debris from the floor. These tangle-free brushes are also known as debris extractors that grab and break down debris, eliminating hair tangles and jams. Roomba 690 and 890: 2 modes – Auto and Spot cleaning modes. - ​Auto cleaning mode: For general cleaning. - Spot cleaning mode: When intensive cleaning of a specific small area is required. Bissell SmartClean 1974: 5 modes - Auto, Spiral, Along the Wall, "Z" Formation, and Diagonal Path. - Spiral - Robot will work in circles until it encounters an obstacle (once it encounters an obstacle it will switch to Auto mode). ​- Along the Wall - Robot will clean along walls and edges. - "Z” Formation - Robot will move up and down the room following a zig-zag path. - Diagonal Path - Robot will move in diagonal paths around the room, adjusting its direction as obstacles are encountered. - Auto - Robot will cycle through all modes as needed (Spiral, Along the Wall, “Z” Formation, and Diagonal Path). All three robots considered here are able to move safely around your home using smart anti-collision sensors to detect objects in their path and navigate around them, for uninterrupted cleaning. If the sensors detect an obstacle, the robot will slow down, and select a new cleaning path. All three robots considered here are equipped with anti-drop sensors that can detect stairs and drops. Therefore, unless some special situation exists, these robots can clean up to and around stairs without the risk of falling. All three robots considered here have dirt detection sensors. Note that Bissell SmartClean is equipped with optical sensors, while Roomba 690 is equipped with acoustic sensors. Roomba 890 has both acoustic and optical sensors. and therefore it is reasonable to expect that Roomba 890 will best detect dirt. Bissell SmartClean does not come with a Remote-Control device. Roomba 690 and 890 both support Wi-Fi and can be remotely controlled from anywhere using your smartphone or tablet via the associated free Android and iOS App (Wi-Fi needed). Note that no Remote Control device is included in the purchase of a Roomba 690 or 890, but, if needed, it can be optionally purchased (see Amazon products section below). Roomba 690 and Roomba 890 both support Wi-Fi. Therefore, they can both be controlled from anywhere using your smartphone or tablet after you download their associated Android and iOS free App to your smartphone or tablet, and as long as the robot is connected to your home's internet via Wi-Fi. Roomba 690 and Roomba 890 are both Amazon Alexa compatible! You can use voice commands to Alexa to control your robot to start cleaning, to stop cleaning, to start charging, etc. When battery power gets low, all three robots considered here automatically return to recharge, all by themselves. After rechaging, they have to be restarted to resume operation if more cleaning is needed. All three robots considered here are equipped with a filter that is attached to the dust bin. As the robot vacuums up dirt, pollen, dust mites, pet dander, mold spores and hair, the filter outputs freshened air. All three robots considered here can be scheduled to clean automatically once a day, 7 times a week, even when you are not there. Bissel SmartClean uses a small device called Invisible Wall that runs on batteries to prevent the robot from entering rooms that are not supposed to be cleaned. An Invisible Wall is included in the purchase of the robot. Roomba 690 and Roomba 890 use a small device called Dual Mode Virtual Wall Barrier to prevent the robot from crossing doorways. But these stand-alone devices can also be used as "Virtual Wall Halos" to protect some restricted area within the room, like for instance the area where the dog food might be. Note that Dual Mode Virtual Mode Barriers require 2 AA batteries that are included in the purchase of the robot. Note that for all vacuuming robots, run times can vary extensively depending on the amount of work the robot has to do to clean the floors. That is because different types of carpets, different floor plans and different amounts of dirt may require different amounts of effort from the robot and hence different amounts of ''juice'' from the battery. D = Diameter; H = Height (i.e. Thickness). ​​So which vacuuming robot should you get? 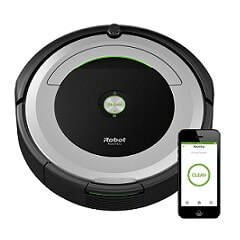 If you want to be able to control your robot using your smartphone or via voice commands to Alexa, then you should consider either Roomba 690 or Roomba 890, as they both support Wi-Fi, a feature not availble on Bissell SmartClean. Though all three robots considered here are equipped with dirt detecting sensors, only Roomba 890 has both acoustic and optical sensors, and therefore, it is reasonable to think that it can best detect dirt. Roomba robots have double main brushes and therefore can be expected to be more effective cleaning carpets. On the other hand, Bissel SmartClean provides you with more cleaning mode options than the Roomba robots. It also has double side brushes, which means that it can better clean along wall edges and corners. It is slightly thinner than the Roomba robots, meaning that it can clean easier under lower lying furniture. Finally, with a fully charged battery, it can clean for about 80 minutes as opposed to 60 minutes for the Roomba robots.